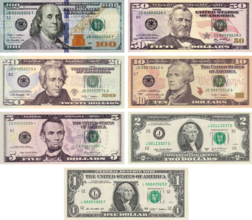 The United States dollar (sign: $; code: USD; also abbreviated US$), also referred to as the U.S. dollar or American dollar, is the official currency of the United States and its overseas territories. It is divided into 100 smaller units called cents. Nickname Buck, bean, paper, smackeroo, dead president, smacker, and greenback. Plural: dough, green, bread, bones, simoleons, skrilla, (bank) clams, mint sauce. Also, Washingtons, Jeffersons, Lincolns, Jacksons, Benjamins, Grants, and Hamiltons are used based on denomination; also peso in Puerto Rico, and piastre in Cajun Louisiana.